Christopher Brown, illustrator and printmaker, first met Bawden at the Royal College of Art. It was Bawden that first encouraged him to explore linocut. Christopher will be talking about his visits to Bawden's home in Saffron Walden. A limited number of the Derby Pug print, commissioned by The Higgins Bedford and inspired by Cecil Higgins' porcelain collection, will be available to purchase on the night. Places are limited so please arrive promptly. 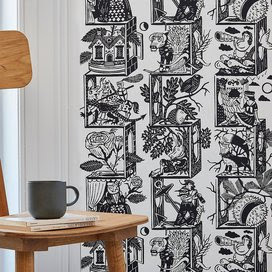 Image: Albion wallpaper design from original linocut elements by Christopher Brown.Available to purchase via St. Jude's website.